My Political Diary – Day 26. I am standing by the graveside of Chief Obafemi Awolowo. Standing beside me is Sister Tokunboh, a wonderful host and my newly adopted sister. I am in Ikenne to have a conversation with the great sage, to ask of him a burning question in my mind. Needless to tell how the conversation was conducted. (S) How are you Sir? I just told you. We are fine. We are resting very well. (S) I have wanted to do this a long time. To meet you. I know. You are here now. Thank you for coming. (S) I am so happy to be here at last. I can feel your presence all around me. This is the place I like to be, to rest and observe what you people are doing to yourselves and to each other. (S) To start with Sir, how shall we communicate so that I know that I am hearing from you. I told everyone I am coming to Ikenne to get an answer to a very particular question that has been agitating my mind, directly from you. How do I know when I get it? You have to figure out that one by yourself. You will know yourself. People may not believe you anyway, but since convincing people is not what you are about, it is entirely up to you how you work it out. Does the answer you get suit your spirit? Does it speak of good, or of evil? That’s the simplest formula. If of good, assume it is from me. (S) Ok. Sir. I get it. I will not hear your voice yet I will receive an answer, and I will know that it is from you when I do. You are a smart lad my son. (S) I have asked a few persons the particular question hoping they knew you well enough to answer on your behalf. Those I spoke to only knew you faintly even though they still had something to say. I will compare what they told me with what I get from you now and work it all out as you advised. Fine. Tokunboh was right when you asked her the same question a few minutes ago. Do you remember what she said? That very few key people that either worked directly with me, or that I trained to take over from me, are around anymore. (S) You are right Sir. She mentioned Ayo Adebanjo, Ebenezer Babatope, Reuben Fasoranti, Odia Ofeinum, and even Bankole Okuwa, as people I should have spoken to. I did not speak with anyone of them. Yes, she is right. Unfortunately, all of them are now scattered in different ideological camps and even political associations. So, what you have done by coming here is best. Go ahead, ask your question. (S) Are you following ongoing political developments in the country Sir? That is not your real question. I am resting here having fulfilled my purpose on earth. (S) That means you cannot answer my real question since you are not following political developments here again. Why don’t you ask first? That’s why you came. You won’t lose anything by asking. But you must be very specific about what you want to know so that when you work it out finally you will know it is my answer. (S) I don’t understand your response sir, when I work it out? Am I the one to work it out? Of course. Do you expect to hear my voice, or receive a written message, or something dramatic like that? I am not alive. I can’t do that. You are creating all of this yourself, even this conversation between us. It is your creation. Yet, I am here, listening to you. You have created this scenario and I am playing along and observing. Do you get it? If you hear a voice, you will go crazy. People will not believe you. That’s not possible because that’s not how things are designed by the Supreme Architect of our existence. You can create what suits you best to communicate with me. (S) I get it Sir. I get it. If you were to wake up today, in present day Nigeria, and see what’s going on politically what would you do? That is also not your specific question. But let me tell you. Some of you have suggested that I will wake up and start to weep, seeing how my legacies have been destroyed through successive poor governments. But weep? Why would I weep? You people did it to yourselves. You ALL destroyed everything because you allowed it. You did not take responsibility for your own future. You all should be doing the weeping, not me. I played my part in building a great environment for my people. I tried to extend the template to the rest of the country. It did not happen. Throughout the process, there was opposition to everything we did, but we had a clear vision, a great plan and competent people committed to making them become reality despite the doubters and the opposition. So, Segun , ask your specific question. What is troubling you? (S) Sir. I have decided to stop being passive and dosomething about the present State of affairs, particularly in my State. I believe that to get anything done, to effect change in my society, one needs to have access to political power. I have, therefore, rather stupidly, jumped into partisan politics without adequate preparation and deep understanding of how that world works. Now I am stuck. Yet, I cannot stop or turn back. You keep coming to my mind every day as if there is something I should know, or do. I have read your vision for Nigeria in those days and seen your handiwork in Western Nigeria. I share every single word of that vision that is still as relevant today as it was when you and your group of founding political leaders did everything you did, and set standards and models that none of the present leaders seem capable of replicating or even sustaining. Thank You Segun, but what is your question? Up to this point you are thinking right. You are also doing ok. So, what is the problem? Your lack of preparation or previous experience in politics the way it has been established now in your State is actually your greatest qualification. You have not been corrupted by preparation. Look at all those before you and see the result of their preparation. They worked hard and did their best but see where all of that has brought a State that should be a model for the rest of the country. These are your words, not mine. I am quoting you from previous writings in reflecting the potentials of your State. ‘Preparation’ is to be infected with corruption, the virus that has destroyed the fabric of your society politically, morally, economically, culturally, and even socially. Get rid of corruption and corrupt people from the system and your society will thrive. Set up machinery for productivity and engage all the people. Empower the people with capacity and education. It is simple. So my son, you are on the right track. (S) I don’t fully understand the implication of what you have said, but it is all reassuring. Thank you Sir. You are welcome, even though I have not told you anything new. The voice you are hearing is your own. You ALL know what is right but choose to do what is wrong because of your poverty-driven mentality. You have to figure things out yourself because the answers are all around you. It is getting late Segun, now ask your question. (S) Ok Sir. If you were to wake up now and want to choose a political association to join in order to kick-start the mental and physical revolution needed to drive the change that the generality of the people are clamouring for, what would that be? Tokunboh gave you a great answer a few minutes ago. She told you I will publicly denounce ALL the parties and their leaders, some of whom use my name to deceive gullible people tempered by hunger and poverty to the extent that they can no longer think and act rationally. She is right. That’s what I will first do. Then I shall not even go near the major parties even with a mile-long spoon. (S) You mean you will not join any of the existing political parties? Remember that you cannot register any new party even if you wanted to. My son, look around you. The political landscape is full of only rubbles. There is nothing to build upon. I will start immediately and afresh to build a new movement of people (young and old) that espouse the values, principles and ethos upon which true development can stand. The new party must reflect of best of the best of amongst the people, with intellect, integrity, and capacity. I shall start immediately to recruit them, and they are all around you, frustrated and only looking for the leadership they can trust. Look closely around the present political parties. There is only one party in the entire country that survived (even if only in name) and is still in existence, from the Second Republic. You always speak about the elements and how they are in control of things and how nothing happens by accident but by a divine script. That is it for you. Why is it that the lone Party is the one that I founded (I did not found even Action Group, go and read its history) in my life, at the restless prodding and insistence of young radical intellectuals on the campus of the University of Ife, including Banji Akintoye who luckily is still with you, and some others, that still exists within the present political architecture? Why? Do you think it is an accident or a divine script? Those are words common to you that you understand – drink from that understanding now! (S) Wow, thank you Sir. I am trying very hard to follow your lead and your examples and your template. 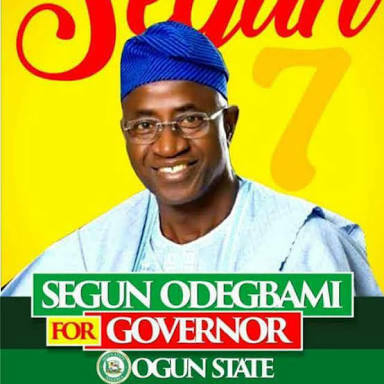 Segun, by the way you bear the same name as my son who departed too early in his life to achieve what many thought was going to be a phenomenal career in law and in politics. Well, another Olusegun is here again and he calls me his father. Tokunboh spoke for me in describing how she feels about you. Your Political Diary has impacted her. She thinks you are a decent and sincere man who can, with others, carry the banner of the Awolowo political ideology into the present political dispensation and make a huge difference. She thinks you can do it. Hold on to her. For now, she is my voice. (S) One more question sir. An eerie silence shatters my reverie. Sister Tokunboh is standing by my side with a smile on her face. ‘Can we go now?’she asks. Together we walk up the stairs of the beautiful Mausoleum in Ikenne, the final resting of Papa Awolowo and Mama, his jewel of inestimable value, into the warm embrace of an evening like no other in my life. My newly adopted sister takes me on a tour of the library and museum housing the life and times of Papa. As I prepare to get into my car with Ayodeji, a car drives into the compound and stops in front of us. It is the Chief Imam of Ikenne. I am introduced to him. ‘Odegbami, Mathematical’, he screams in excitement as he extends a warm handshake. Sister Tokunboh tells him my mission. He went straight into prayer mode, and blesses the moment and the venture. That is my parting gift from the home of Chief Jeremiah Obafemi Awolowo. Now that I have my answer, I also know what I shall do. Senseless Attacks On Amaechi, Security Agencies and INEC: You Are A Drowning Man, Rivers APC Blasts Wike.